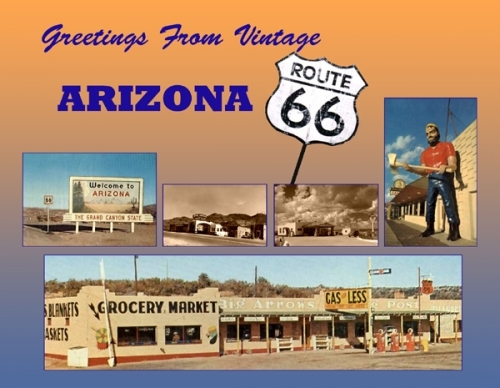 Vintage Arizona Route 66 Postcard - Custom original only available at Legends' General Store. Text on back: Greetings From Vintage Arizona - Vintage photos: Welcome to Arizona, Cool Springs Camp, Two Guns Service Station, Lumberjack Cafe, Flagstaff, and the Big Arrows Trading Post. Postcard is brand new and in mint condition.